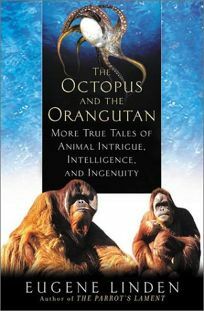 Eugene Linden, writer for Time magazine, revisits the territory of his Parrot's Lament, delving deeper into the animal world, and reemerges with The Octopus and the Orangutan: More True Tales of Animal Intrigue, Intelligence, and Ingenuity. From the observations of trainers and handlers as well as experiences in the wild, Linden presents anecdotes that illustrate the workings of the minds of both domestic and wild creatures-how they use tools, play games and adapt to change. In ""When Elephants Cheat,"" Linden explores animal deception; in ""The Starling that Charmed Mozart,"" the composer's bird is thought to have sung his music. Linden brings readers closer to an understanding of intelligence in general and an appreciation of these creatures with whom we share the earth.